Calling All Engineers . . . for the FIRST LEGO League Robotics Competition Team! We’re getting ready to field our FIRST LEGO League Robotics team for the 2018 season … are you in? What is FIRST LEGO League (FLL)? FLL is an international competition organized by FIRST (For Inspiration and Recognition of Science and Technology) where elementary and middle school students come together to compete on a specific real-world scientific challenge. 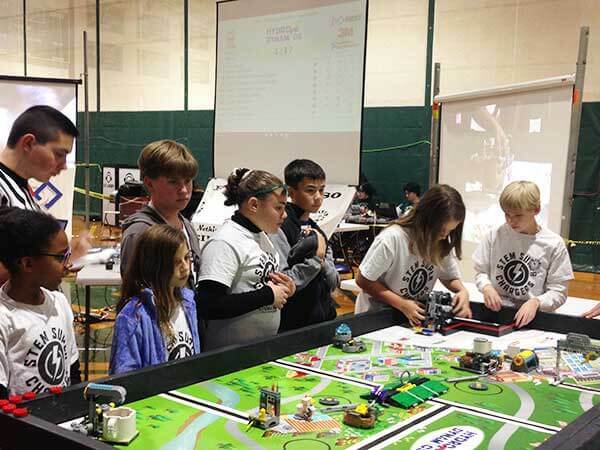 Working in teams, children research and develop solutions to the current season’s challenge and then design, build, and program a robot using the LEGO robotics systems. The team is meant to provide a fun, creative, skill-building experience. They will learn the value of teamwork, respect for others, and discover their own strengths. Teams are forming for children in grades 3 to 8. Please visit our robotics team page for more details and to register for our information session and team.